We’ve already looked how Jesus actively listened to those He served. Why? — Because it matters. It was just one more way He showed people God’s heart toward them. He not only communicated with His words but also by listening. When we actively listen as Jesus did, we too will communicate the heart of God who deeply cares about each individual (Lk. 15). 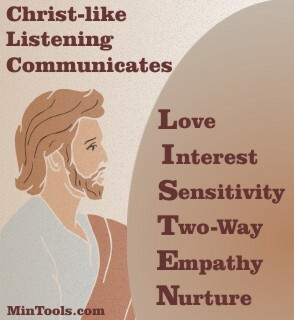 The following acrostic, using the word LISTEN, helps us better understand what Christ-like listening communicates which is why to listen matters so much. To listen let’s people know that you care about them and who they are matters. Listening to people’s ideas communicates that their experience and what they think matters. When we listen to people we’re letting them know that their wants and what they need matters. To listen suggests reciprocity, a mutual exchange, not just talking at them, communicating that what they have to offer matters. Apart from actually walking in their shoes, listening is how we will begin to understand what people are experiencing, letting them know that what they feel matters. Active listening usually leads to people feeling built up, not torn down, and so their inner being as well their relationship with you and the Lord gets nurtured, suggesting that what they derive from this interaction matters. Next → Next post: Organization Because of Freedom in Christ?